The best part about this project is, I was totally confused when I first saw it, and thought that someone had changed up the Holiday Inn Express proposed for 371 Elmira Road. But I think I can be forgiven for the error – both projects are 4-story, 54′ tall hotels prepared by Optima Design and Engineering out of Buffalo. However, the two projects diverge from there. Project description here, elevations and lot layout here, project application here. The hotel as proposed for 339 Elmira Road is a small one, 37 rooms, current being described as “independent” (no chain affiliation), which given its size is no big surprise. The 6,468 sq ft building is situated for an empty 0.59 acre lot, what was once home to the Salvation Army store before they moved down the road a few years ago and the building was demolished. 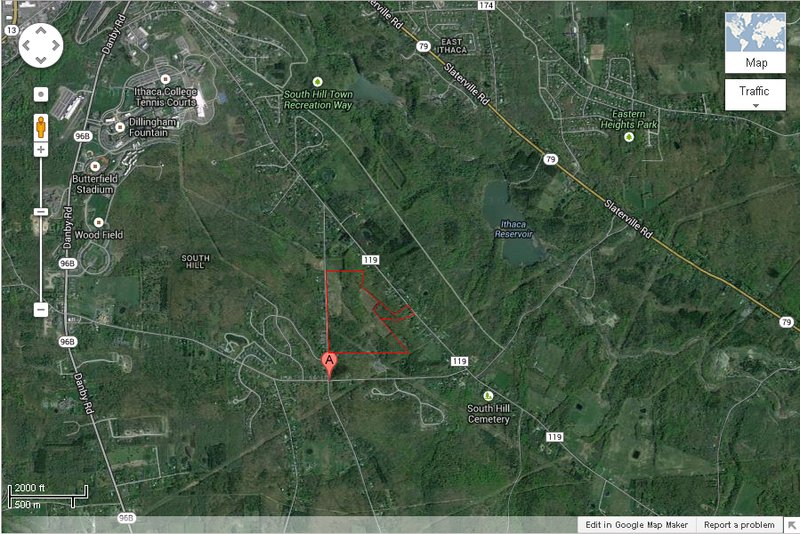 Jason over at Ithaca Builds reported that the land sold for $143k last summer. The project’s application predicts a time frame of construction from June to December of 2014, and a project construction cost of $1.7 million. What Ithaca gets for that $1.7 million is a typical suburban-style box hotel, a smaller version of what you typically find at highway exits. 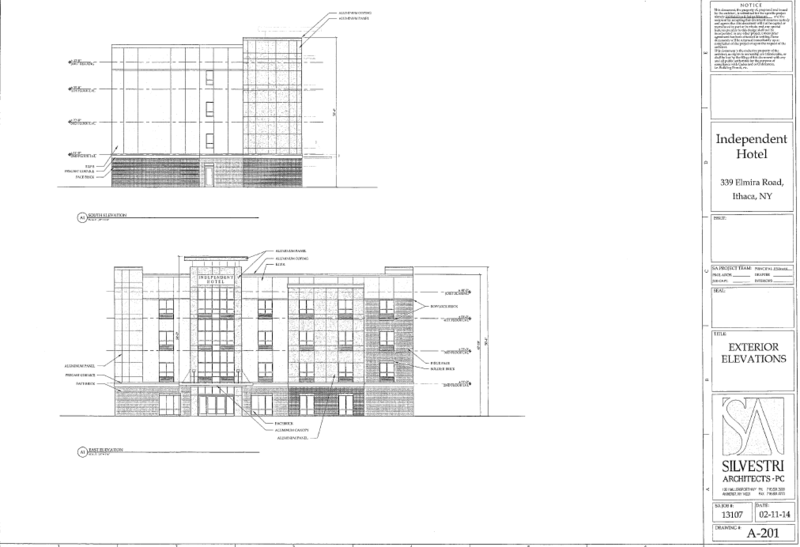 In a way, that’s what this stretch of Elmira Road/Route 13 is becoming – previously, it was just the Comfort Inn, then the Hampton Inn in 2003, the Fairfield Inn last year, and now this and the Holiday Inn Express are in the proposal stages. That would mean 219 more hotel rooms in this area then there was in 2012. On a completely unrelated note, the infill project by Heritage Builders at 128 West Falls Street continues their fine tradition of developing underused city/town parcels, even if the designs are a bit ungainly. Here’s an interesting concept coming out of Collegetown Terrace: A proposal to exchange some of the interior parking for more housing. This info comes courtesy of the city of Ithaca, which will have to grant a zoning variance in order to let such a change proceed. 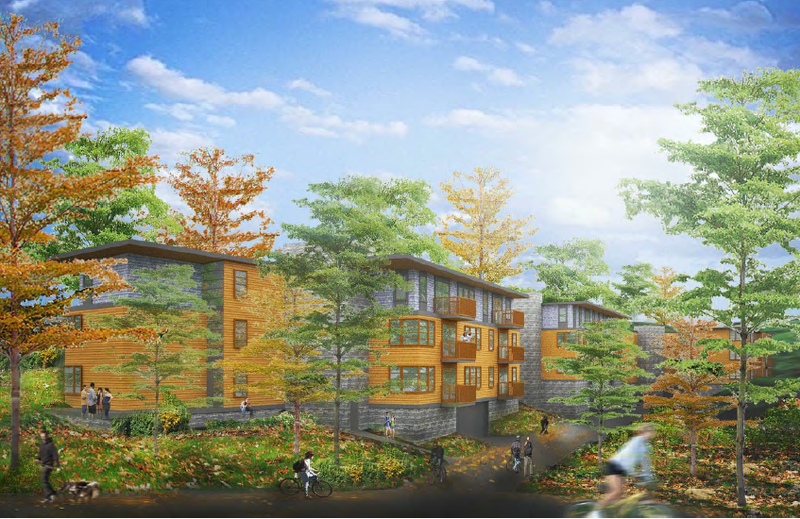 The last phase of Collegetown Terrace (phase III) is slated to begin later this year, with construction complete by summer 2015. Phase III is supposed to focus on the construction on the last building, #7 (formally known as 120 Valentine Place), a long, curving building very similar to the currently underway #5. 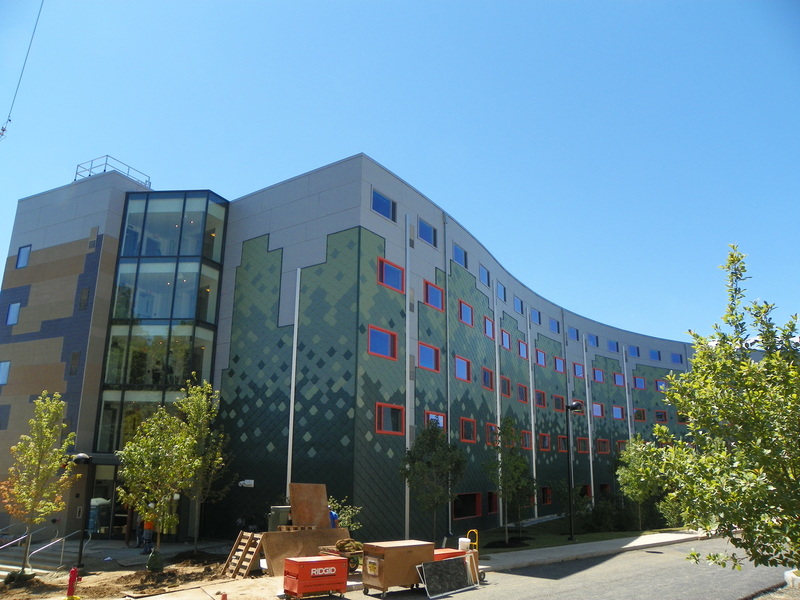 The whole complex as-is provides 1177 bedrooms and 699 parking spaces (5 more than legally required). However, the developer (Novarr-Mackesey) has noted that only about 50% of tenants utilize parking, which means about 100 will go unused (guest parking tends to only make up a very small % of lot use). They have put forth a rather unusual proposal where the second floor of parking for building 7 would instead be 80 units of dorm-style housing: all tenants get their own bed and bath, but share kitchens and community spaces. After reconfiguring some two-bedrooms to three-bedrooms, the net gain of units is 69 (from 178 to 247 in Bldg. 7). The current buildings, #5 (112 Valentine, 167 units) and #6 (113 Valentine, 71 units) would be unchanged. Zoning calls for 703 parking spaces in the new setup, the develop wants to put in only 652, which they claim it would still result in 50 underused spaces. So here we are. I know even the regulated 9 additional spaces for 80 more units seems a little unbalanced, but the unit reconfiguration and the small square footage of those “dorms” allow it to be so. Changes to the exterior are expected to be minimal. At a glance, this is a nifty idea – the dorm units are expected to rent for about 50-67% the cost of a typical studio or one-bedroom in the complex (which looks to be around $1000, so $500-$670 for these). Since Collegetown Terrace mostly appeals to wealthier echelons, this sort-of mixed-income aspect is appealing, and it gives a different group of landlords increased competition for tenants; also, it makes for a denser parcel, and does a favor to those seeking to buoy business in Collegetown, and avoid more home-to-rental conversions. However, I doubt the neighbors will be amused (some are not fans of having so many college students gathered in one complex), and the parking discussion (which so far is based only off “experience”) will be reviewed with a figurative magnifying glass. I feel like this project could be a major test-bed of the city’s evolving views on parking requirements. I think the biggest thing I learned from Ithaca Builds is the importance of searching for and reading city documents. Since they’re rapidly digitized and made available for public knowledge, it’s not a necessity to stop in city hall anymore. Even better, it has an option to check out the most recent docs, so it’s like one-stop shopping for news. All the extra knowledge is a curse and a blessing. For instance, the latest Common Council agenda, which proposes additional restrictions on an intended rezoning of Cornell Heights, all of which is geared towards keeping the 1 Ridgewood apartment project from happening (I wonder what legal grounds the developer would have in such an event). This isn’t the first time something like this has happened – the vacant lot at 121 Oak Avenue in Collegetown was slated for a 3-story, 6 unit (20 bedroom) building in the late 2000s, but Josh Lower put the kibosh on that project once the city started the endless discussion with the Collegetown rezoning, and the planning board wouldn’t support his project because of the debate. On another note, Josh Lower might have the worst luck of any developer in Tompkins County. On the other hand, readers get an idea of projects in the pipeline. It’s what allowed me to beat the Daily Sun to the punch on the Gannett Health Center plans. Then there’s all sorts of little projects, like a lot subdivision on Auburn Street that shows the design of the new house, or the proposal for three more houses on West Falls Street. On a larger scale, it also shares big outlines, like what INHS plans to do over the next couple of years, which I’ll discuss here. 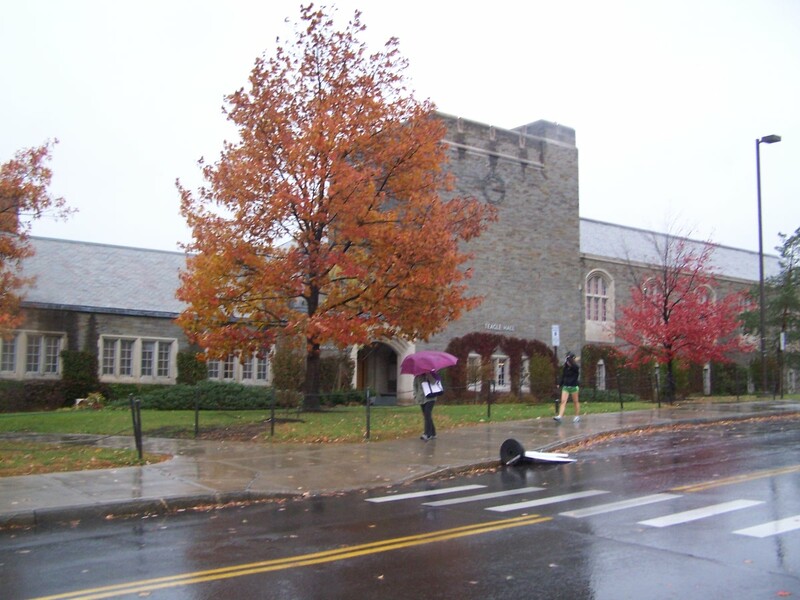 The INHS pipeline comes courtesy of this Ithaca Urban Renewal Agency agenda. Most of the stuff is, for the purpose of this blog, “babble”; filings needed to designate INHS with some special privileges. But among this babble is a recently completed and underway projects list, on page 47. 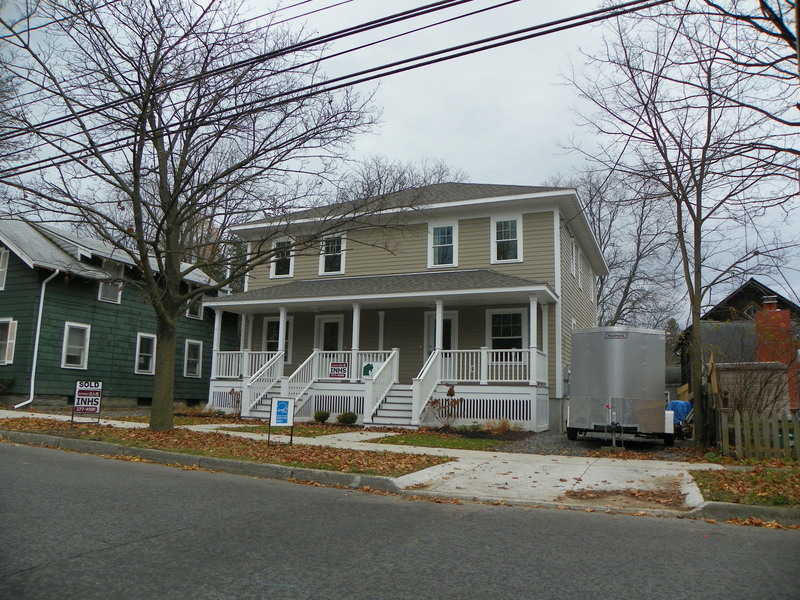 In the past year, the 72-unit Poets Landing project in Dryden (a Conifer LLC project they assisted with), Breckenridge Place, and a house purchase/remodel on Hawthorne Place were completed. Go back a little further and you see Holly Creek Phase I and a few small developments, like the duplex on East Falls Street in the lead image. 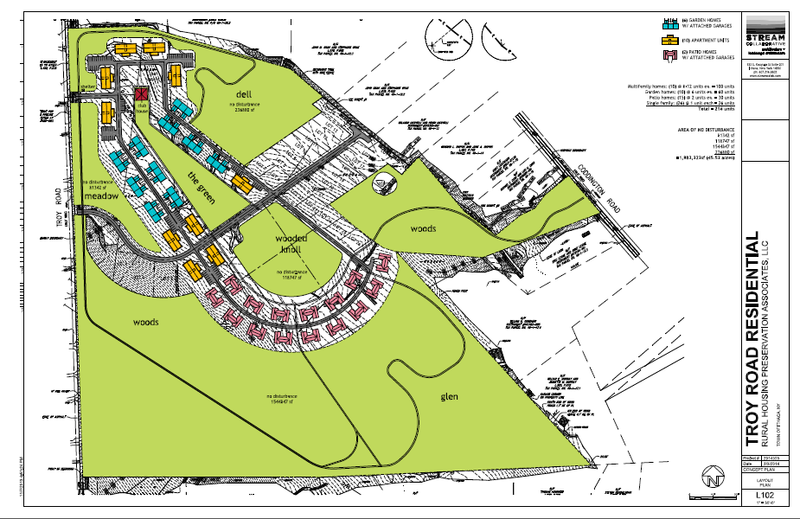 In the future list, for 2014 there are only 14 units – two houses (one a duplex), and Phase II of Holly Creek. A few months ago, I googled the architect of Holly Creek to see her other work, and instead found out her back-story is traumatizing. Congrats to her for surviving it and being able to move on with her life. Anyway, in 2015, INHS has 148 units planned for completion – four townhomes and a house, the Stone Quarry apartments and its 35 units, 62 units in Cayuga Meadows (I guess it dropped from the 68 Jason first reported on IB), and the irksome Greenways project, which has dropped from 67 to 46 units. I have no idea what to make of it anymore. The big projects should all be completed by October 2015, but make of that what you will; Breckenridge came in behind schedule, and non-profit/government building projects are well known for building delays. Things are getting a little complex with the development planned at 1 Ridgewood, a Cornell Heights parcel squished between Ridgewood and Highland Avenues. First, the revised plans for the smaller project. 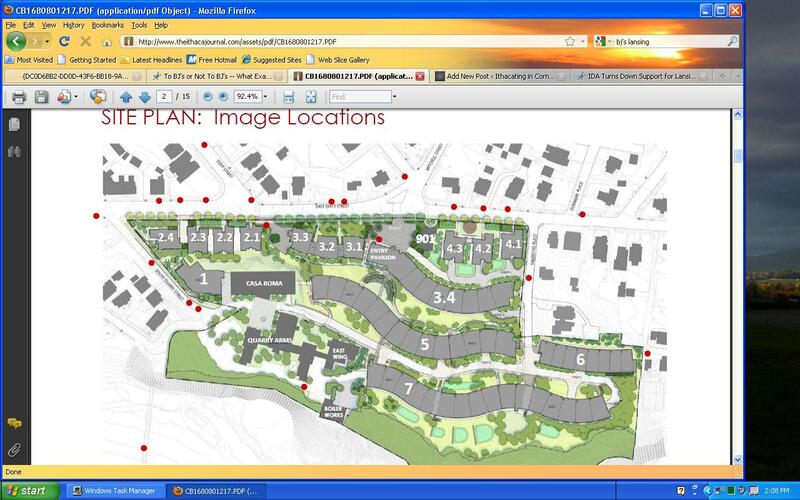 While the original plan had 64 units in one large building, this proposal has shrunk it down to 45 in three buildings. Notably, even with the size change, the overall design is not all too different, materials and massing look to be the same as before. One floor has been removed, giving three floors over an underground parking garage (a small surface lot would also be built on the property). 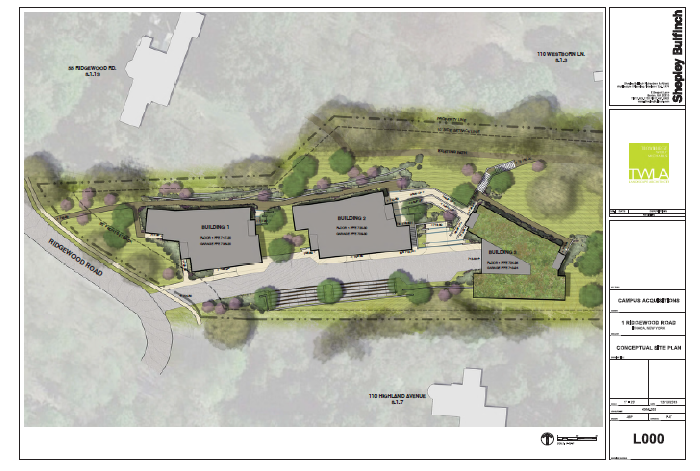 The focus is now more on the western side of the property facing Ridgewood, with less attention given to the Highland Avenue side of the property in this updated plan. Since the tendency with student-focused projects is to count the bedrooms, the 45 units contain 114 bedrooms for occupancy. One of the complicating factors in this project is the zoning change proposed for the property. Currently, it’s R-U, which is less restrictive than the R-3aa they are proposing to rezone the parcel to. At its best, it’s an attempt to mitigate increasing developer interest in the historic district; at its worst, its a heavy-handed attempt to stunt development. For the record, this and the Thurston Avenue Apartments project seem to be (have been?) 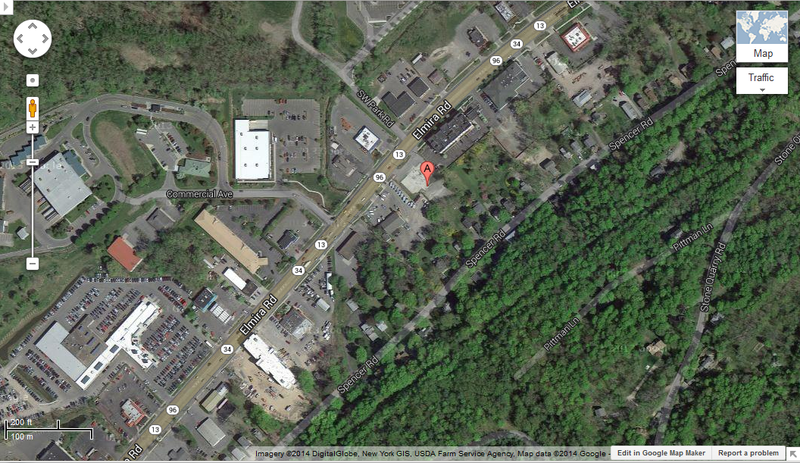 the only two underutilized parcels in the affected area. The revised 1 Ridgewood project PDF goes out of its way to note that this project just barely meets the R-3aa requirements, so even with the zoning change, no variance would be required. This is important, because some neighbors are fiercely opposed to any development of the parcel whatsoever. They would be able to shut the project down much easier if it were seeking a variance, but since it doesn’t, it gets a lot harder. We’ll see what happens as this makes it through the bureaucratic rounds. EDIT: Ha ha, silly me to think they might let this one go. The Common Council is voting on additional restrictions to the R-3aa zone that would effectively kill this project. The proposed language adds a special amendment for historic districts such as Cornell Heights that says that any new building can’t have a footprint more than 120% of the average footprint of the historic structures on a block. Cornell Heights historic structures are mostly mansions in the 1,500-2,000 sq ft footprint range, which these exceed. This amendment seems to be explicitly targeted to keep this project from happening. Well, I suppose if there’s demand, and a lack of easily developable to the north, west and east, suburban developers would have targeted South Hill for big projects sooner or later. Fresh from the press comes news of a proposed 216-unit development for the town of Ithaca, on two lots just east of Troy Road, a little north from its intersection with King Road. The PDF of the plan is here, in the town agenda. The proposed project is virtually all residential, divided up into 26 single-family lots, 80-120 apartments, 60 garden homes, 30 patio homes, and a 5,000 sq ft clubhouse with your lease office and a few office spaces for rent. To me, it has the airs of a cut-and-paste suburban development. For the record, a garden home is a cute way of saying townhome, and patio homes are (in this case) one-story duplexes. The architecture theme is “rural agricultural” style: the apartment buildings will look similar to barns, and the patio homes will resemble small farmhouses. The target markets are empty nesters, and twenty-and thirty somethings (grad students and young professionals). As easy as it to poo-poo this, there is a worse alternative – that which is currently okay under the zoning, which is 70 to 90 lots of low-density residential sprawl. This project, if it gets to proceed as a Planned Development Zone (PDZ) a la Ecovillage, would only disturb about 22 of the 67 acres the two lots comprise. The project is being developed by Rural Housing Preservation Associates, which looks to be an awkward corporate offspring of a few development companies in the Northeast and Mid-Atlantic, and has enlisted the help of local companies STREAM Collaborative, Whitham Planning & Design, and Hunt EAS. Honestly, the armchair architecture critic in me is okay with those choices. Something like this will have a multi-year buildout, and there’s been considerable development on South Hill in the past several years. But not anything on this scale. It’ll be interesting to watch this project evolve as it moves through the bureaucratic process. Image Property of Phi Mu sorority. Courtesy of the Cornell Sun and Cornell Chronicle comes news of the latest addition to Cornell’s Greek Life – social sorority Phi Mu. According to the news articles, sorority interest has increased in the previous few years, from 670 registrants in 2010 to 873 in the latest rush (Chronicle claims 871…don’t know which is correct). This moved the Cornell Pan-Hel system to add a 13th sorority. If one views Phi Sigma Sigma as a replacement for the departed Alpha Omicron Pi, then Phi Mu would mark the first time there have been 13 Pan-Hel sororities on campus since 2003, when Delta Phi Epsilon and Chi Omega closed, and were replaced by Alpha Xi Delta the following year. If you go a little further back, there were 14 as recently as 1996, before Alpha Gamma Delta closed (comparing the old photo in that link to my 2008 shot, their physical house went downhill fast). Given that there are a number of sororities that used to have a presence at Cornell, it’s rather unusual to see a colonization rather than a re-colonization; Phi Mu has never previously been installed on Cornell’s campus. Lookins at their wikipedia page, it would seem that most of their 117 chapters are based out of the South and Mid-Atlantic; so being in the northeast is unfamiliar territory for this sorority. There are options ladies. It will be interesting to see where the sorority ends up making its physical home, and hopefully build upon a house’s history.